This is my “right hand man” who taught me a lot what Street knows in regard to video production. When “Carlitos Way” ran East Chicago Public Access Television, he would help everyone. He had patience and had a knack for teaching you what he knew. He wasn’t against having a good laugh whenever the situation presented itself. Later on in Hammond, a lot of volunteers and guest on the Public Access Television show called “Your Time” on channel 21 knew Carlos Godinez as “Uncle Chuck”. These people can attest to “Carlitos Way”. Street gives everyone nickname. He was also “backbone” of Public Access Cable in East Chicago and Hammond with Rob Schultz..
As of 1am in the morning on August 22. 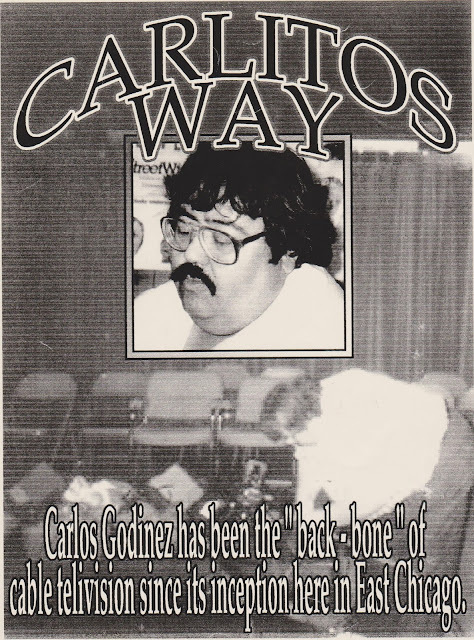 2015, Carlos passed away surround by family and friends. Like Street told Curt Vosti, “I’d be re-missed if I didn’t tell you. Carlitos Way was and is my right man. Rest In Peace, and my God love you.